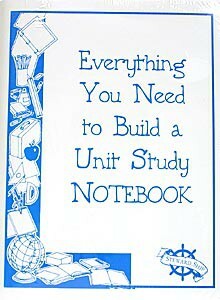 This Notebook package is all about making and using Notebooks as a project and includes the tools to do it. This two-part package includes: an instructional book listing the benefits of building notebooks, materials needed, making subject dividers, using record sheets, etc. Such a great resource providing a huge number of generic ideas for assignments for all ages and any unit study topic. The second part includes the 50 masters to photocopy and use in all notebooks. Some forms include: Book Report Form, Blank Assignment Sheet, Vocabulary Sheet, Students Record Sheet, Biographical Sketch Sheet, Newspaper, Scroll, Preschool Lined Paper, Section Divider Degsigns, Notebook Timeline, Wanted Poster, Photo Template, Picture/Fact Template, Thematic Writing Paper, U.S. & World Map, and much more. Contains Christian content. From Stewardship Publications.